Long Island is the perfect place to plan a dream wedding. There are many parks to choose from when it comes to planning a local outdoor wedding, and Long Island’s beautiful natural scenery will give it that wow-factor. Imagine your big day at one of the Island’s beautiful beaches, world-famous golf courses, lighthouses, museum exhibits or at a beautiful arboretum. If you want refreshing ideas for the big day, take a look at these stunning parks that offer venues and other services to create your dream wedding. 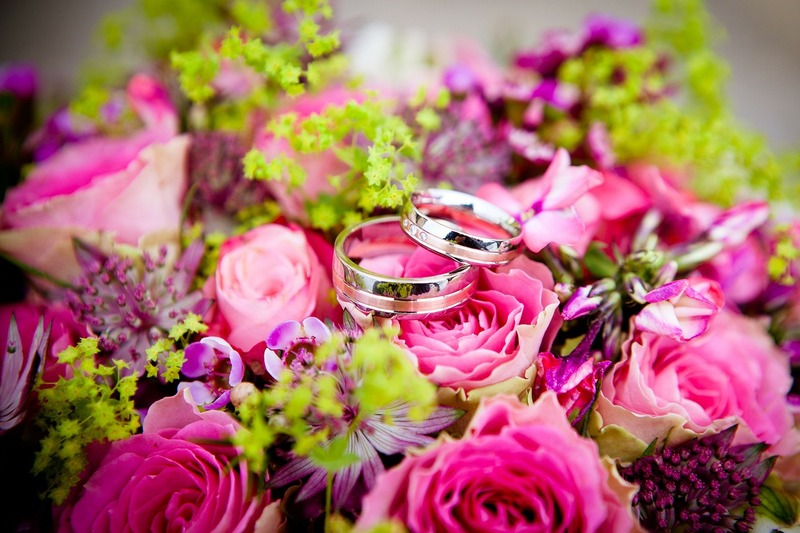 On Long Island, you can have a beautiful outdoor wedding which you will remember forever! Here are the Long Island Parks that will allow you to use their grounds for your special day. From Montauk to Huntington there are a multitude of parks to choose from to host your ideal Long Island wedding in a venue close to home in Suffolk. These Suffolk County parks offer an array of beautiful indoor and outdoor ceremony and reception areas along with a variety of on-site services like catering. Beautiful white sand beaches and home to some of the finest saltwater bass fishing at this 296-acre barrier beach park makes it a beautiful east end outdoor wedding destination. For your catering needs, there's Cupsogue Beach Hut. Check out the Mansion at West Sayville, located inside Hard Estate-West Park. Have your wedding indoors, inside this elegant 1909 estate where you can enjoy a spectacular panoramic view of the Great South Bay. The venue will host only one wedding at a time, so you know the Mansion’s staff will be dedicated to meet your every need. Spend your entire wedding day taking beautiful photos on-site at this dock-side treasure and on-site dressing rooms means the opportunity to comfortably and easily prepare a change of attire for different photography shots. The Mansion at Timber Point is a 300-acre historic country mansion set to a panoramic view of the Great South Bay. Looking over the rolling hills also gives way to a view of Fire Island. It offers an elegant indoor setting for year-round beach weddings. This stillwater beach located on the Great Peconic Bay is one of the most secluded beach wedding destinations on Long Island. Located on the east side of the Shinnecock Canal, this is where you can enjoy peaceful views of those windsurfing and sailing. For your catering needs, there's Meschutt Beach Hut Raw Bar & Grill offering a diverse menu complete with seafood specialities. Enjoy a wedding along Suffolk County's largest oceanfront park! It provides a more laid back setting as the barrier beach if frequented by sportsmen, surfers, and the general beach-goers. It's complete with white sand and the rolling Atlantic surf to help set the mood. For your catering needs, there's Smith Point Beach Hut. It features a diverse menu and seafood specialties. Smithtown Landing Country Club is nestled within the Smithtown Landing Golf Course alongside the Nissequogue River. Enjoy your wedding surrounded by a pristine paradise. The venue offers three separate facilities for your exclusivity. Arrangements can also be made for so that you have cocktail stations presenting delicacies from around the world. Some of the most beautiful park weddings on Long Island are held in the stunning parks of Nassau County. From arboretums and museums to galleries and beaches, Nassau County parks offer a full range of park wedding options from simply outdoor events to beautiful and elegant indoor receptions you and your guests will never forget. Located on the North Shore of the Island, this estate is home to the only accredited arboretum on Long Island. On the beautiful 42-acre property, guests may enjoy stunning views of trail grounds and gardens combined with an exquisite indoor facility beautified with the diversity of ornamental trees. This is one of Nassau County's passive parks. It is a 5-acre property running long and narrow with a walking trail and beautiful pond surrounded by native flowers and vegetation. The other half of the park features wooded grounds with maples trees and a stream that feeds into the pond. This 8-acre park offers a long, winding pond. The eastern side of the park includes a half-mile walkway. Couples and guests can enjoy a beautiful wedding surrounded by the beauty of nature. The Cradle of Aviation Museum offers a historic one-of-a-kind venue complete with aircraft hangars and flight displays as the backdrop. Its majestic atrium where dining and dancing may take place is complete with a four-story high glass ceiling adorned with authenthic aircraft suspended in mid-air. For your catering needs, Philip Stone Caterers is the exclusive on-site caterer. Larger than Central Park, Eisenhower Park is an oasis in Nassau County. The 930-acre property offers space for summertime entertainment, special events, and so much more! The Carltun on the Park offers a restaurant, bar, banquet facilities and a meeting room to host stunning weddings. The beauty of the pond with numerous benches surrounding it provides a peaceful and relaxed environment to host your special day. The 8-acre park is adjoined by Milburn Creek Park where you can find a half-mile walking and jogging trail and boat launch. Historic Hempstead House, Castle Gould, and the grounds of the preserve, once the famous Guggenheim Estate, are available for private celebrations and corporate entertaining on a grand scale. Capture your wedding amongst natural and historic treasures. A walkway circles this 9-acre park's pond, making it a popular destination for wedding photos Its walkways were restored in 2007, making it an enjoyable destination for the nearby residential community for a walk, stroll, or job in the park. Indoor & Outdoor Receptions & CeremoniesThis beautiful 84-acres santuary of oak forests, ponds, and stream is putting your wedding day right in touch with nature. The Tackapaushu Preserve is one of the South Shore's most popular preserves. The 3,000-square-foot museum is also frequented by many to learn about Long Island's ecology and special events may also be hosted there on weekends. If you head towards the central section of the preserve, you can find a small, secluded pond with waterfowl. More than 170 bird species live within the preserve so there's a high chance you can catch wedding photos with the beautiful animal species in their natural habitat, too! Set your wedding day within a a beautiful 11-acre park and preserve complete with a lovely nature trail. The property is also home to a pond with a renovated brick walkway surrounding it. It can be the perfect destination for a small and initimate wedding cermony gathering. 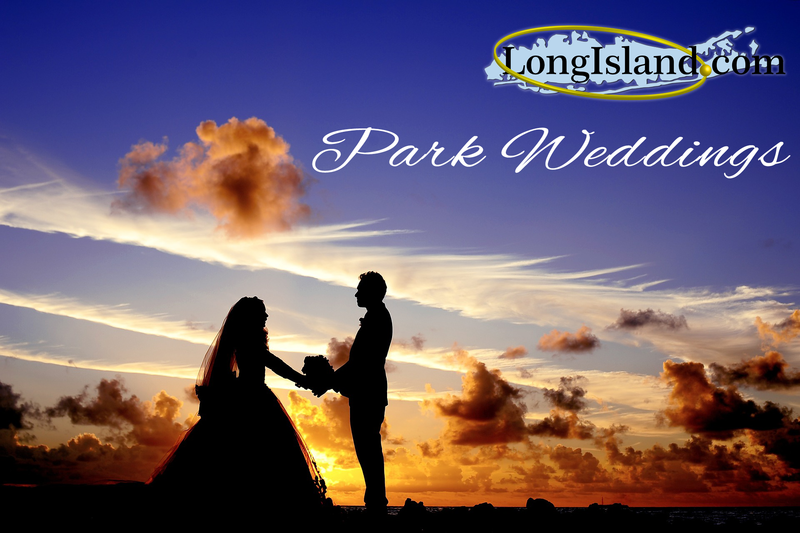 Long Island State Parks offer many more choices for beautiful park weddings. There are 12 reservable picnic pavilions for a weekend or holiday wedding celebration on a first come, first serve basis. Many parks also offer onsite catering services, which will take some of the burden off of your wedding planning. Whether you envision an indoor ceremony overlooking the Long Island Sound, or an outdoor reception on the sandy south shore, you'll find your ideal venue within a Long Island state park. Locations with reservable picnic pavilion are indicated with (**). If you're looking for a quiet and more low-key wedding then planning your special day at Bayard Cutting Arboretum State Park may be the perfect place. This is where you'll find beautiful trails among a diversity of tree species -- a perfect backdrop to a private wedding ceremony. 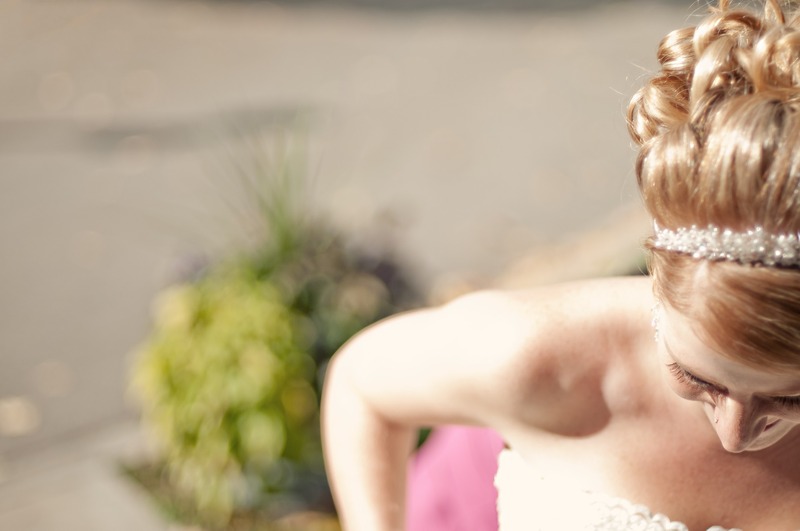 A permit is required for all wedding ceremonies as well as for photography. There are a few other restrictions like no chairs, decorations of any type, and capacity is limited to approximately 20 persons. This 463-acre park offers views of a large duck pond and ample walking trails for your guest to explore. Belmont Lake is 42-acres large encircled by paths and multi-use trails. Plan a wedding surrounded by nature. For your catering service needs, contact the general number above. One of the most spectacular wedding venues on Long Island, this was the site of the 2002 and 2009 U.S. Open Championship. The park is also complete with bridle trails and Carlyle on the Green offering a grand conservatory ballroom that overlooks the beautiful world famous Bethpage Black golf course. Barn weddings are all the rage for modern brides who are looking for a laid-back and rustic atmosphere for their special day. The George Weir Barn, located on Caumsett’s park grounds, overlooks Lloyd Harbor on the Island’s North Shore, combining rustic charm and maritime beauty. Located on Long Island’s South Shore, Hecksher Park is 1,600 acres large and provides picnic groves that make an ideal spot for group get-togethers. There are three pavilions available by permit only. For your catering service needs, contact the general number above. A picnic pavilion surrounded by natural lush scenery can be rented for large parties through the permit department. This state park also provides bridle trails for horse back riding and a historic hand carved wooden carousel. For your catering service needs, contact the general number above. Jones Beach is one of the most popular parks on Long Island with its 2,400-acres of maritime environment, so for some brides no other venue will do for their big day. While parties are not allowed to use any structures or set up chairs, the standing ceremony/exchange of vows set-up works great for many couples. Guests get to enjoy the beautiful oceanfront setting and natural environment. Wedding ceremonies held at 360 East at Montauk Downs features breathtaking panoramic views of Montauk with a panoramic view of an impressive 18-hole golf course. If you're looking for a majestic backdrop, you'll get it here. You also don't to worry about finding catering because the beautiful catering facility is right there. Have your ceremony in front of Montauk’s famous historic Lighthouse. Montauk Point State Park is located on the eastern-most tip of Long Island and the Lighthouse is the oldest lighthouse in New York State, dating back to 1792. 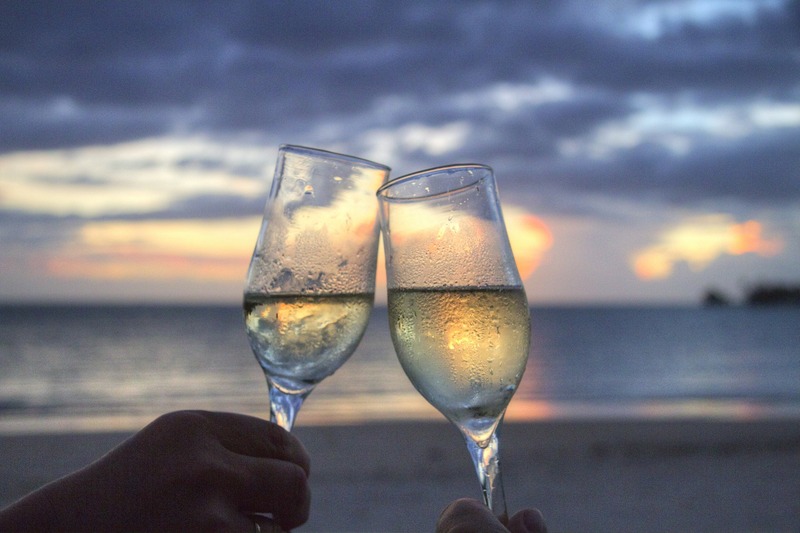 Your special day can be complete with stunning views of the Atlantic Ocean. Block Island can also be viewed in the distance. Wedding ceremonies and photographs are by appointment only. The park is complete with five miles of ocean beach, picnic areas and the 18-hole Robert Moses State Park Pitch & Putt Golf Course. While parties are not allowed to use any structures or set up chairs, a standing ceremony/exchange of vows can work out just perfectly for the casual and romantic wedding. For your catering needs, contact the general number above. This park is located right on the North shore with the perfect beach view setting right on the boardwalk overlooking the Long Island Sound. On clear days, the view reaches Connecticut, and the large moraines of Long Island’s north shore stretching to the east. The park also offers large picnick areas and pavilions to host special events like weddings. For your catering needs, contact the general number above. Valley Stream State Park offers a very humble, family-friendly wedding venue. The park is complete with two nature trails and a picnic pavilion available for reservation. For your catering needs, contact the general number above. Know of any other Long Island park wedding venues? Let Us Know about them!